The author grew up at the Ward paint factory in Windmill Road, Mitcham, and describes life in the area mainly during the 1930s. of this habit, the disc would swing back and forth, hardly settling before it was set swinging again. understand how he operated his business or what he meant when he spoke of ‘picking up fares’! do it but my hand was not strong enough. part that – yes – he was definitely different from the rest of mankind! perhaps a few smiles from any folk who lived in Mitcham at the same time as all of the above. a ‘tied’ cottage and therefore was part of my father’s wage. tinderboxes were dispensed with, lucifers were manufactured here, allegedly for the first time. moved his factory from Blackfriars in London after that factory had unfortunately burned down. Fire was to follow this company throughout the remainder of its history, but more of that later. Pen and ink drawing of Samuel Ward paint factory, by Mrs Iris C Marshall, with the Overy family home on the left. era. This latter school appears now to cater only for very young children. How times have changed! consider eating even after thorough washing. numerous kittens that were born was a bonus for me. in this well earned respite. that he would run out of stock and all because of the game the adults seemed to delight in. have been a very kind person – not given to arresting schoolgirls at all! was explained to me later that his profession of course was a form of carpentry known as cooperage. GARDNER was in fact Bill Gardner, but in my innocence I reckoned that he was a gardener. the men have given to have access to pesticides and the like as we are able today. home. I was given a board on which to play with this gooey mess. me off for my own good without upsetting me. thoughts for a child really. for business during the weekdays and at weekends. travelling in another world – the mileage seemed so great! A castellated brick wall, topped with broken glass, surrounded our kitchen garden and orchard. of the wall was so damaged that intruders just used to clear the ditch and walk in on our produce! was made public – it was the famous Crystal Palace, Sydenham Hill, ablaze. it was transported or who did it! staged just for us two. understand the foundations of the original old Mill are still in the grounds of this property. sometimes surpassed those of France. his mates’ parading in a Roman scene. a velvet curtain. Shows were not going on at the time and we decided to peep round the curtains. Charlie Chaplin. We felt very important that we had stumbled across all this in such a famous place. juice, fizzy drinks, iced cakes. We munched until we could not munch any further! would not be able to get home. My brave friend scoffed at this notion but I still felt very uneasy. who I turned the money over to, probably to the leaders of our group when I next saw them. outside the lodge not knowing where to start to look for me. Poor man! dismayed and were truly sorry that I was no longer allowed to belong to their outfit. my heart would inexplicably pound in case I saw one of our neighbourhood ‘bobbies’ on his beat. My brother insisted that if I walked on the same side of the road as a policeman I would be arrested! good day out for us so far! embodied in the china on the mug. directed into the area surrounding the Fair Green and Cricket Green. elevated ledges to rest picnic lunches brought by the children who intended to have a ‘long play’. summer months with patients suffering from diptheria and scarlet fever. afternoon; I believe this little row of original cottages still stands. for quite a few seconds because it bounced up and down suspended from a large spring-like base. our noses twitching with ecstasy! follow my own wishes in this regard. other, overtaking and picking up members of the public who indicated that they wished to board. instance grateful for all faculties. and would stay for a couple of hours. St George’s Road for a time. They disappeared; probably evacuated when the war commenced. and sit with hands over our mouths not daring to announce our presence. Stirring times indeed! the fuel tank would have been situated. In the complete ignorance of youth, we set fire to the grass. used by a subscriber in this present day. when leaving home! I struggled to bring a suitcase downstairs that was used for storing clean linen. the moonlit sky and were surely reaching towards me to gather me up! I had left home long enough. I called out to be let back indoors and never chanced such a move again! any change from the shopkeepers. On more than one occasion she managed to lose a sixpence. Woolworths Stores advertised their products as “NOTHING OVER SIXPENCE”. that one was in charge of the situation! for the ordinary folk, as we have today when so many brand names are offered for sale. womenfolk felt their toiletry and grooming complete after using them. she received from all of us! nobody would light the bonfire on the allotted day and time but him. at the immense patience my parents always showed me. along. It was fun making one’s own amusements. riding this sensation-seeking piece of machinery. child with much still to learn about life and how to conduct oneself. better than any I have tasted since. have passed by in recent times there is just a hollow where the magnificent roots once were. School badge was an oak leaf with acorns. round the estate. It was a godsend to housewives until shops were built closer to their new homes. should have done by rights because the canopy covering his fruit and vegetables was so flimsy. longest distance to and from home to try and get in on these bargains; I never was successful! of the poor goldfish never survived for long. Such is the ‘cruelty of children’ at times. V and Queen Mary). The exact date escapes me at present, but it was around 1928.
uninteresting black chauffeur-driven car; the princess seated in the rear dressed very ordinarily! did catch my interest was the sight of two burly policemen busily ‘frog-marching’ a perpetrator! excited onlookers. I don’t suppose I shall ever witness the like again! and have them transported to “The Wilson” as we affectionately called the hospital. In present days it must prove a great loss to the local public that the hospital has been closed. We, in our time, felt it was a safe haven in times of need. 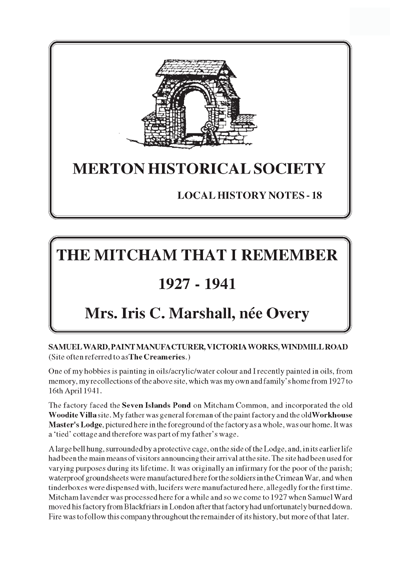 This entry was posted in Publications, Local History Notes and tagged in industry, lhn, mitcham, Reminiscences, urban mitcham.